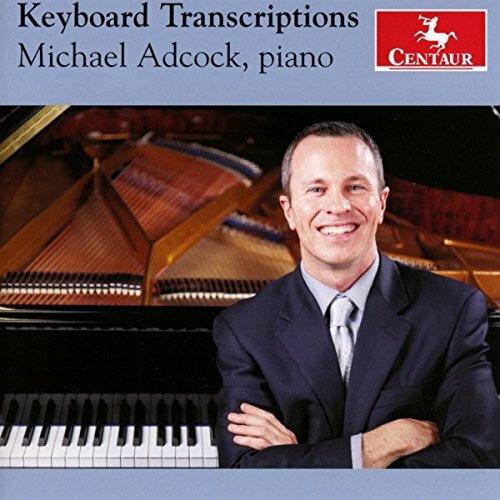 Released in 2016, Michael Adcock’s recording of piano transcriptions features an interestingly varied program that also revisits some of the great virtuosi who created these pieces. Adcock is a student of Leon Fleisher and Ellen Mack and teaches at Washington Conservatory in Maryland. The release is a collection of virtuoso showpieces that also pays homage to some of the great pianists of the 19th and 20th Century. The Prokofiev is a fairly muscular work at times but requires a great deal of interpretive shading along the way. There are several recordings of the work but none by the sort of “big name” soloists. That is fine, because it then boils down to programming and Adcock may have the edge here with his blend of Romantic favorites and some jazz. The first half of the program are the ten pieces that Prokofiev selected from his rejected ballet of Romeo and Juliet. The Ten Pieces for Piano, Op. 75 were created in 1937 from the early suites the composer salvaged for orchestral performances. The selections move us across the main moments of the story launching with a delightful “Folk Dance” and then moving us through a few scene settings before exploring characters. Adcock has a crisp articulation here and tends to make the most of the accents in the music drawing these out quite a bit. The music here really requires some attention to shading and interpretation and Adcock proves to be up to the task. His performance of “The Young Juliet” is a certain highlight that captures the delightful playfulness in the opening measures as well as the romantic depth in the lyrical, reflective moments. These shifts between Prokofiev’s modernist and almost impressionistic qualities is captured very well here. “Montagues and Capulets” is another perfect example of how Adcock carefully shifts to capture the different tones in the music. “Mercutio” is eqully impressive. The listener is essentially enthralled quickly by the performance and this makes for a very satisfying performance. For the second half of the program, Adcock must channel some of the greatest virtuoso pianists of the last 200 years. The program nicely bookends these with first a Liszt version of the Schumann song, “Widmung” and then Godowsky’s fascinating version of “The Swan” from Saint-Saens’ Carnival of the Animals. In between are the Seven Virtuoso Etudes (1950/1976) that Earl Wild (1915-2010) created from popular songs by Gershwin. Wild was one of the finest of interpreters of Gershwin’s music with classic performances of Rhapsody in Blue that are still hard to beat. These etudes are almost like “what if” explorations of technique and musical style that runs the gamut from Liszt to Rachmaninoff and even Art Tatum. Each familiar song is thus transformed into something even more amazing than its tuneful familiarity might otherwise suggest. Adcock’s performances are stunning here with a sense that these are evolving almost like improvisations which is quite amazing. Vladimir Horowitz’s Variations on a theme from Bizet’s “Carmen” was one of the pianist’s popular encores. Though written down, he never published the work which appears to have been altered at least a few times over the years. It was one of the pieces he performed and recorded in 1978 for his White House concert. The current piece then is a sort of codified version of the variants Horowitz introduced across his career. It is after all the sort of piece a 19th-Century composer/pianist would have tended to create on the spot and it is fun to have this nugget on this recording as well. The program here is really well-conceived. It demonstrates different aspects of Adcock’s technical skill, virtuosic flair, and interpretive ability. The music here is certainly the sort of collection of music that even a casual listener will want to return to regularly.